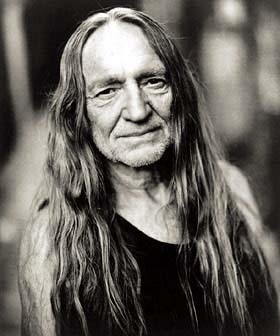 In a business built on changes in cultural fashion, Willie Nelson seems very much the same as he was when he rose to national prominence in the mid-1970s -- still the same sinewy, off-the-beat, jazz-inflected voice, the same benign countenance and the same hippie/thrift-shop costuming. The mileposts along his way tell a lot: He first charted in 1962 (with "Willingly"), had his first No. 1 in 1975 ("Blue Eyes Crying in the Rain"), scored 19 more No. 1's over the next 14 years and then returned triumphantly to the top again in 2003 via his duet with Toby Keith, "Beer for My Horses." 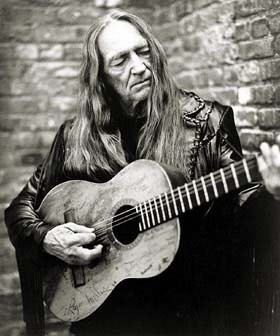 Willie Hugh Nelson was born April 30, 1933, in the tiny farming community of Abbott, Texas. After his parents separated, he and his sister Bobbie (who still plays piano in his band) were raised in that small farming town by their grandparents. He developed an interest in music early, singing in church when he was 4 and writing his first song when he was around 7. He also began assimilating from his community and the radio such different musical influences as gospel, western swing, pop, jazz and polka. At 9, he began playing in a local band. After high school, Nelson served briefly in the Air Force and then spent some time as a student at Baylor University. Beginning in the mid-'50s, he worked as a disc jockey in Texas and Washington, played in honky-tonks and continued refining his skills as a songwriter. In 1960, he moved to Nashville and signed as a songwriter with Pamper Music. He joined Liberty Records in 1962, his first major label deal. It didn't take long for country artists to notice his talent as a composer. In 1961, Faron Young scored a No. 1 with Nelson's "Four Walls." Later that year, Patsy Cline hit it big with "Crazy," and Billy Walker did moderately well with "Funny How Time Slips Away." In 1963, Ray Price, in whose band Nelson had once worked, had a No. 28 hit with the urbane, jazzy "Night Life." Nelson's second single for Liberty, "Touch Me" in 1962, took him to No. 7, and that would remain his chart high point for the next 13 years. He recorded for RCA from 1965 until 1972, then moved to Atlantic Records. Dissatisfied with his pace as a recording artist, he returned to Texas, where he became a focal point of Austin's emerging progressive country music scene. It was during the early '70s that Nelson switched from suits and short hair to jeans, flowing locks and the omnipresent bandana. He staged and starred in the first of a series of outdoor music festivals -- the famed Fourth of July Picnics -- at Dripping Springs, Texas, in 1973. The concert drew thousands of fans more oriented to rock music than country, and he completely won them over. In 1975, Nelson began a fruitful association with Columbia Records that would last into the '90s. As part of his deal with the label, he was given basic control over what and how he recorded. 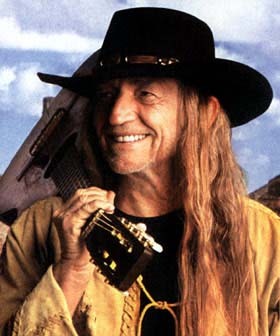 His first album for Columbia was the stripped-down and stark concept album, Red Headed Stranger. Although some at the label thought it sounded like a collection of demos, it proved its appeal when one of its songs, "Blue Eyes Crying in the Rain," went No. 1. Nelson's outsider mystique gained a name in 1976 with the release on RCA Records of Wanted: The Outlaws, a compilation of tracks cut by Nelson, Waylon Jennings, Jessi Colter and Tompall Glaser. Henceforth, Nelson was a charter member of "the outlaw movement." What that meant, essentially, was having creative control over one's own records, which had long been the practice of rock artists. From 1975 onward, Nelson's star rose. He was the subject of hundreds of prominent articles, not only in fan magazines but also in the general press. He appeared on the then hip Saturday Night Live and began acting in movies. His album Stardust, which came out in 1978, stayed on the country charts for 10 years. In 1982, his album Always on My Mind won the CMA's album of the year award, while the title cut won for single of the year. 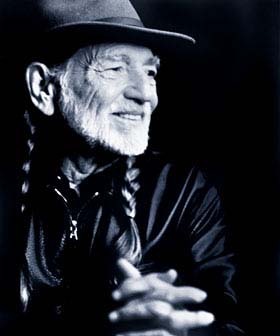 During this period, he won five Grammys for his best-known work, including "Always on My Mind," "On the Road Again," "Georgia on My Mind," "Mammas Don't Let Your Babies Grow Up to Be Cowboys" (with Jennings) and "Blue Eyes Crying in the Rain." As befits such prolific tenacity, Nelson has been showered with honors, among them admission to the Nashville Songwriters Hall of Fame (1973), the Country Music Hall of Fame (1993) and the Songwriters Hall of Fame (2001). In addition to the six Grammys he has won for specific records, the Recording Academy (which confers Grammys) has also given him its Living Legend Award (1990) and Lifetime Achievement Award (2000). Nelson has been nominated for 43 Country Music Association awards and has won nine of them, including the entertainer of the year prize (1979) and the vocal event of the year trophy (2002) for his duet with Lee Ann Womack, "Mendocino County Line." That collaboration also won a 2002 Grammy, 20 years after his previous win. The fact that his first appearance on the charts was a duet (with Shirley Collie, then his wife) may help account for Nelson's alacrity to be a duet partner for others. He has since recorded albums and/or hits singles with Tracy Nelson, Jennings, Price, Ray Charles, Leon Russell, Webb Pierce, Darrell McCall, actress Mary Kay Place, Hank Cochran, Danny Davis & the Nashville Brass, band member Jody Payne, Johnny Bush, Roger Miller, Dolly Parton, Merle Haggard, Brenda Lee, Julio Iglesias, Kris Kristofferson, David Allan Coe, Young, Porter Wagoner, Curtis Potter, Norah Jones, Sheryl Crow, Sinead O'Connor, Neil Young and the aforementioned Womack and Keith. One source puts Nelson's total number of duets with different artists at more than 80. He joined forces with Jennings, Kristofferson and Johnny Cash in 1985 for the No. 1 single, "Highwayman" and an album and tour of the same name. In 1979, Nelson made his first foray into movies with The Electric Horseman, which gave him some wonderfully funny scenes with Robert Redford. He followed with Honeysuckle Rose (1980), in which he was the star -- and which introduced the song that would become his theme, "On the Road Again." Subsequent films include Thief (1981), Barbarosa (1982), The Songwriter (1984), Where the Hell's That Gold?!!? (1985), The Last Days of Frank & Jesse James (1986), Red Headed Stranger (1987), Once Upon a Texas Train (1988), Dust to Dust (1994), Gone Fishin' (1997), Wag the Dog (1997), Outlaw Justice (1999), The Journeyman (2001) and The Big Bounce (2004). In 1990, the Internal Revenue Service presented Nelson with a tax bill for over $16 million and then seized most of his property to cover it. Nelson even managed to turn this setback into a publicity bonanza when he released the fund-raising double album, The IRS Tapes: Who'll Buy My Memories. For the past several years, Nelson has recorded critically praised work for a variety of labels, including Liberty, Justice, Island and Lost Highway. 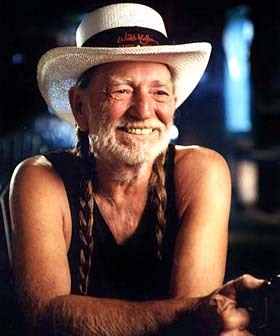 As a political activist, Nelson co-founded the Farm Aid music festival in 1985 with fellow performers Young and John Mellencamp. Its purpose was and is to raise awareness about and funds for America's family farmers. Nelson has co-headlined the event every year since its inception, except for 1988, when it wasn't held. In 2004, he endorsed and appeared at benefits for Democratic presidential candidate Dennis Kucinich. Besides the songs cited above, Nelson also wrote such standards as "Angel Flying Too Close to the Ground," "Good Hearted Woman" (with Jennings), "I'm a Memory," "Three Days" (with Young), "Me and Paul," "Bloody Mary Morning," "Pretend I Never Happened," "Why Do I Have to Choose," "Yesterday's Wine" and "Touch Me." Nelson's albums -- nearly 300 titles, including repackagings -- have sold millions. Stardust, his 1978 cover collection of the pop hits of his youth, exceeds 5 million in sales, according to the Recording Industry Association of America. Three others have sold 4 million copies each, along with two double-platinum albums and nine platinum albums.